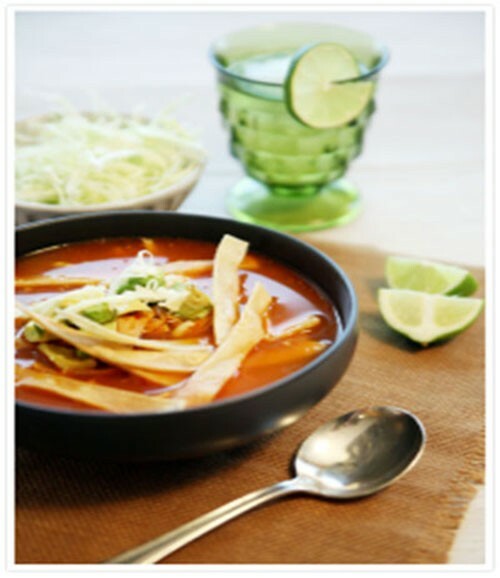 1 pound skinless, boneless chicken breast, chopped, 1 1/2 teaspoons chili powder, 3/4 teaspoons ground cumin, 1 can fat-free chicken broth, 1 can diced tomatoes with jalapenos, undrained, 1 1/2 cups frozen corn, 1 cup water, 4 green onions, sliced, 1/4 cup snipped fresh cilantro, 3/4 cup avocado, 3 cups mini round baked tortilla chips, coarsely crushed, 1 lime, cut into 4 wedges, shredded cheese. In a large nonstick saucepan with a spoon of oil cook chicken over medium heat for 2 minutes. Add chili powder and cumin; cook, stirring, for 30 seconds. Add broth, tomatoes, corn and the water, bring to simmer and cook for 5 minutes. Add green onion and cook for another minute. Divide among 4 bowls. Top with cilantro, avocado and tortilla chips. Serve with lime and shredded cheese.